No pipeline: A real alternative. A brand new rail link has been proposed by a consortium of First Nations and business people called G7G (Generating for Seven Generations) Rail, to move oil by rail from Northern Alberta through Northern BC, Yukon, and NWT to Alaska's super oil port near Anchorage, entirely bypassing the Rocky Mountains. 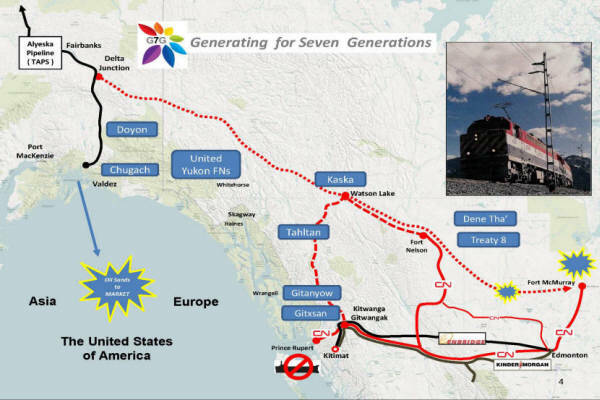 This proposal was recently announced in the National Post on November 30 by Matt Vickers, CEO of G7G, and it replaces the need for an Enbridge pipeline through the Rocky Mountains to the west coast at Kitimat, BC. This new rail line, estimated to be complete by 2017-18, would provide social, economic, industrial and many more benefits to the people of the whole region, as well as serve as a direct link to the rest of the country--something a pipeline could never provide. If the federal government forces the issue of exporting oil to China and elsewhere in Asia then this alternative should be seriously considered by all governments as well as by the oil industry. 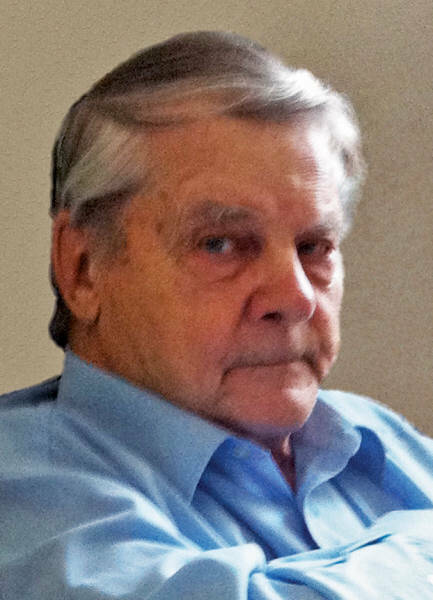 Alf Nunweiler is a long time resident of Prince George. He retired after 42 years as a dispatcher with CN Rail in 1989. He was BC Northern Affairs Minister, and MLA for Fort George 1972-1975, preceded by two terms on Prince George city council. A risky pipeline from the Alberta Oil Sands through the Rocky Mountains to Kitimat, B.C. is merely a one-way street to China, and benefits nobody other than the oil interests. Oil pipelines which are powered by a massive 1500 to 2000 psi (pounds per square inch) of air pressure, with a so-called safety valve kickout at 2700 psi may very well be compatible in the desert of Saudi Arabia or Iraq, but is certainly not compatible through the Rocky Mountains, lakes, rivers, streams, canyons and the sensitive rugged terrain of Northern BC. 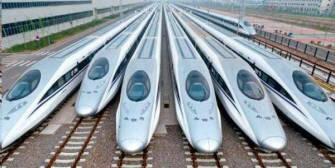 For the oil interests it would mean the most modern high-tech rail transportation system in the world. The railway with a single track costs $8.4 billion for a carrying capacity of 1.5 million barrels a day, double track costs $10.4 billion for a carrying capacity of 5 million barrels a day. This compared to the Northern Gateway pipeline to Kitimat on the west coast which is reported to cost $5.5 billion for a carrying capacity of only 525,000 barrels per day; and Kinder-Morgan's proposed pipeline-twinning to Vancouver, reported to cost $4.1 billion, which would carry only 300,000 barrels of added capacity per day makes. Keep in mind that the capacity of the modern railway far exceeds the capacity of any pipeline. Having retired from CN RAIL as a train dispatcher after 42 years service I know most of us railroaders are aware that when double track is added, the capacity volume would triple accordingly. New equipment would undoubtedly be designed with modern triple axles instead of traditional twin axles, in which case the load per car and train would increase by about 30%. 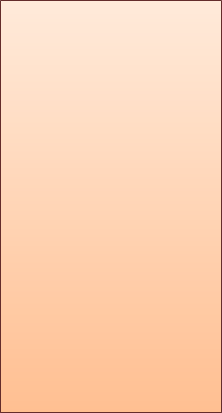 Thus the convenience of flexibility to adapt to changes as volumes demand. No pipeline can match that volume and serve the oil industry and the multi-commodity needs of the people and industry in the region as well. Simply put, it would take six pipelines through the Rocky Mountains to match the capacity of the new railway--that bypasses the ecologically-sensitive Rockies--to Alaska. There's no comparison. Using this route, oil could go by rail from Fort McMurray to Alaska where there already is a high capacity oil port near Anchorage, Alaska. But the real benefits would be to the people of the region. A two-way double track modern railway with the newest technology would serve everyone--with multiple spinoff effects. Truly a world-class system. Fort Nelson, B.C. would likely become a service center for this rail-line, and a connection-point with CN Rail. Spinoff benefits could include, for example, large iron-ore deposits in the Yukon being brought by rail to a future steel-mill in Prince George, creating approximately 4000 jobs (according to calculations made in 1974-75, while I was B.C. Northern Minister, when NKK of Japan was making plans to build a steel mill in Prince George with North-East BC Coal. They later reversed their decision in 1976 to build their steel mill in Japan instead, with our coal. This was a major disappointment at the time to the late mayor Harold Moffat and myself). 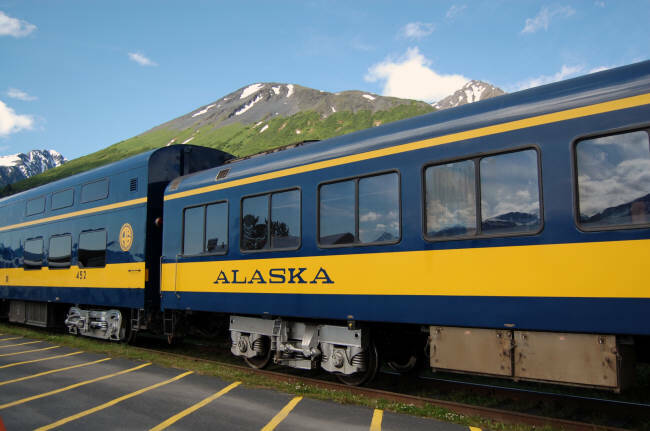 Another example would be the 260-year supply of limestone available in Alaska which could service North America's needs for cement production if it could be transported by rail, while currently the U.S. is importing limestone from overseas. There are numerous other resource deposits which could be accessed if there were a rail link. Oil revenue would largely finance the railway. The proposed G7G Rail double track, 1600-mile (2400-kilometer) world-class railway would serve everybody. For the people in the region, with the First Nations as partners in managing and operating the railway, with thousands of permanent high paying rail jobs and spin off jobs from new industry, the rail line would build a strong economy for the whole region. For the people of the north including the First Nations it would mean no more isolation, an end to the extreme cost of everything that families, businesses and industries need, and likely raise living standards. All basic commodities currently are burdened by the high costs that thousands of miles of transport truck and airlines entail. Indeed the system would serve everybody, not just China and the oil interests. This route would do much more than move Alberta oil to China. The people in the region would finally get a modern rail transportation corridor to southern Canada and the US Midwest which they have been demanding for decades. It would spark economic and social development as was seen in western Canada after the CPR and CNR were built across the prairies to the west coast from 1885 to 1916. Those rail lines triggered the mass immigration of our grandparents' era, and is the reason most of us are living here today. The same could happen again in the twenty-first century in Canada's northwest. The late author Pierre Burton, a native of the Yukon, once told me years ago when I was BC Northern Minister that he would call a railway to the Yukon an "EXTENSION of the NATIONAL DREAM." Burton wrote the books The National Dream and The Last Spike, about the construction of the Canadian Pacific Railway, built in five years from 1880-1885, in a race to the west coast to keep B.C. a province of Canada instead of becoming a state of the United States. Oil through a pipeline is simply a one-way street to China and does not provide any of these spin-off benefits. People in the north have for decades been longing for a rail corridor to southern Canada and the US Midwest. The G7G railway would make that dream a reality, while simultaneously eliminating the need for environmentally questionable pipelines. Northern railways exist elsewhere in Canada. 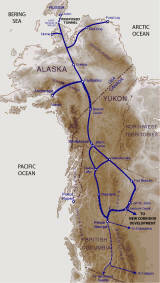 The CN Rail line to Pine Point, NWT, a rail line to Churchill, Manitoba, and Quebec-Northshore-Labrador Railroad (QNLR). The QNLR has been operated mostly by First Nations People for the last 25 to 30 years. This proposed G7G Railway would likely be the most productive by far than any of these others. It would seem that there should be no reason whatever why this proposed railway should not be given serious consideration. It appears to be the best alternative to all the other proposals. In summary I would strongly recommend this G7G Rail proposal from Fort McMurray to Alaska be given serious consideration. I trust this discussion will begin to answer the question: WHAT WILL A MODERN WORLD-CLASS RAILROAD DO FOR THE PEOPLE THAT A PIPELINE CANNOT? 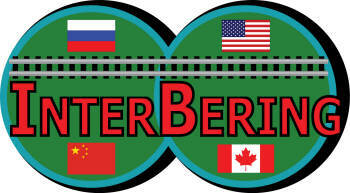 INTERBERING: A Railway From Canada To Alaska: Ready To Be Built In Six Years.